These motors come with lots of walnut veneer and leather and were the epitome of the typical up-market British car - very comfortable, quiet and good performance with imposing presence. When Dad bought this Super-Snipe about 18 years ago it needed a lot of work on the body and this was done by my brother. Since then the car has covered about 100,000 miles and now needs more work as it is quite scruffy again. One of the inherent problems is water, leaking through the wrap around front and rear screen seals, which eventually does further damage elsewhere inside the car. During the time we've had the car it has had a major engine rebuild, a replacement auto transmission and several rear axle rebuilds. The roads that Mum and Dad drive on in Surrey, Kent and Sussex include a lot of steep hills and a lot of quite rough country lanes - all of which take their toll on a heavy car of this age. The Snipe 6 cylinder engine was never as good as the Hawk 4 cylinder motor. It only has 5 main bearings and we are sure this contributes to the main bearing rumble and relatively early failure that has been experienced. It is also Dad's experience that all the Humbers had weaknesses in the rear axle and manual gearboxes - certainly on the sorts of road that we use. Later versions of these cars had improved components fitted but when you purchase used parts you don't know their history. Before the Snipe we had about 6 Hawks all with the 2,267cc engine, these cars were replaced when the bodywork became tatty - some had gearbox and axle problems but all the engines were good. August 2000 and the Super Snipe has gone - it became too scruffy to pass the MOT and has been replaced by a Volvo 740 Estate. 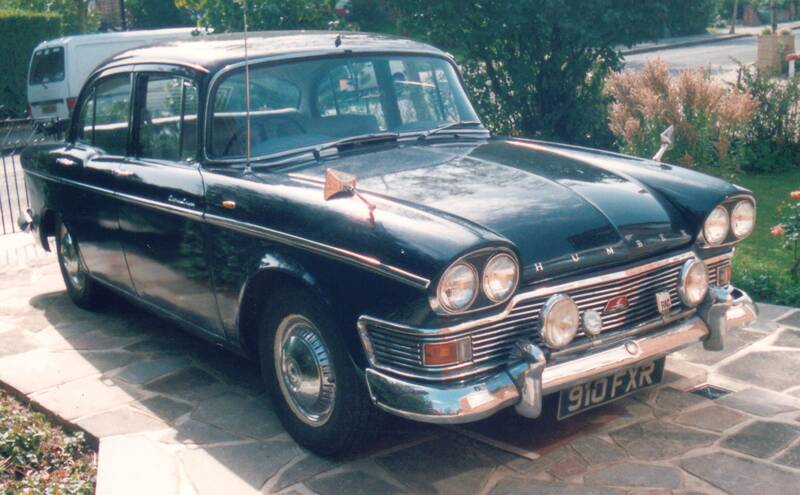 The Humber is sorely missed but when you are 84 you have to be sensible about your car. Maybe someone will do it up or at least use the parts to keep another one going. 6 cyl. 2965cc. OHV. 130bhp. All leather and walnut trim. Independent coil spring front suspension.